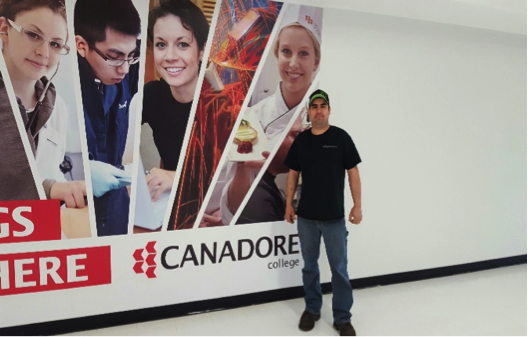 Carlo Dokis is a member of the Dokis First Nation and has been pursuing his Automotive Service Technician Apprentice with Hopper Buick GMC in North Bay, ON. With assistance from Gezhtoojig Employment and Training under the Apprenticeship Tools Grant, Targeted Wage Subsidy, Carlo was able to complete the Level 1 work hours and educational components to proceed to Level 2 in his apprenticeship. Carlo has aspirations to become a Journeyman Automotive Service Technician and “would like to see more First Nations people in the trades industry.” Carlo is a positive role model for his home First Nation, but all First Nations people as his dedication and hard work reflects a work ethic employers seek.